In the front window of Homeblown Glass on Fourth Street in downtown Santa Rosa, Noah Nunez blew into a twirling molten glass bulb, commanding a combination of heat and centrifugal forces to enlarge the water pipe’s main dome around a small, intricate sculpture of Lewis Carroll’s Mad Hatter. Dazzled by the blend of fire and skill, a mother-daughter duo stopped by the front window and gawked at the show. “What’s he making?” the elementary school-aged girl asked. For nearly a decade, Homeblown Glass has given the art of glass-blowing a stage on Santa Rosa’s bustling main drag with a work station positioned behind the front window. 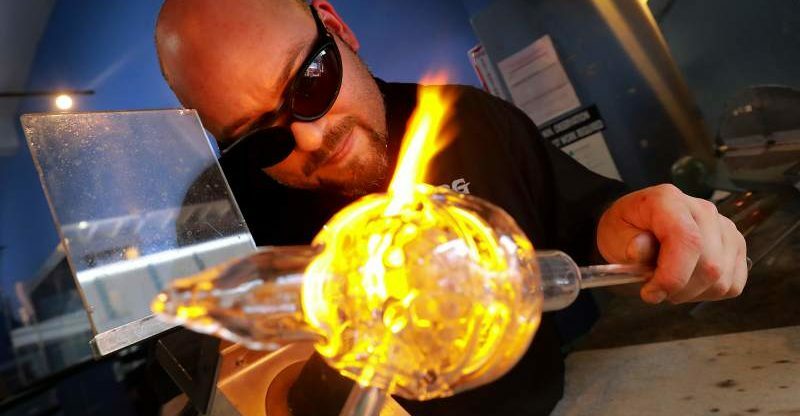 Nunez, 37, of Santa Rosa is the shop’s full-time lampworker, toiling at the torch to make glass vases, jewelry and other custom-ordered designs in addition to his mainstay: water pipes, commonly known as bongs. Inside the shop, visitors encounter a 500-gallon fish tank and cases filled with colorful art pieces such as a jellyfish crafted with gold ribbons suspended in a glass paperweight. 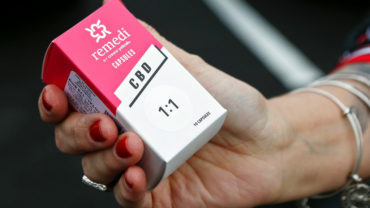 The water pipes — staff are instructed to urge people to avoid the term “bong” or any mention of cannabis because its use is still prohibited under federal law — are in back behind a set of swinging doors and a sign informing visitors only those 21 and older can enter the tobacco pipe area. The store is owner David DeSadeleer’s main retail space alongside a smaller, original storefront on North Main Street in Sebastopol plus a separate glass manufacturing warehouse in Southern California. Other Sonoma County head shops have more elaborate collections of water pipes from a variety of artists — some worth thousands of dollars — such as the Peacepipe Smoke Shop and the Mighty Quinn. But DeSadeleer said his is the only shop owned by a glass blower with an artisan making custom orders on-site. DeSadeleer, 40, of Sebastopol, said he began learning the craft just after graduating from Analy High School at a time when glass-blowing was a small, insular universe of people with “hotshops” in their backyards. Both he and Nunez, high school friends, had the same mentor who taught out of his rural Sebastopol garage. DeSadeleer first opened his shop in 2003 in a former dry cleaners near the Umpqua Bank in downtown Sebastopol. That was the year the Drug Enforcement Administration staged a series of raids targeting places selling pipes and bongs online — dubbed Operation Pipe Dreams. Several Northern California outfits were swept up in the raids, including a Santa Rosa glass-blowing business called California Colorchangers on Barham Road. Under the auspices of Operation Pipe Dreams, agents raided hundreds of businesses and homes in six states in a multimillion-dollar coordinated mission. The convictions that followed for selling drug paraphernalia across state lines resulted in fines and probation for about 50 people. The only person to serve time was actor and comedian Tommy Chong, who with his family ran the Chong Glass company in Gardena. He served nine months in federal prison and forfeited more than $100,000. Nunez was a glass blower at the Barham Road facility at the time of the raids. He was not involved in sales, and therefore not involved in the case, but was out of a job the moment the federal agents arrested his employer at gunpoint. A couple weeks later, Nunez was walking to his new job at Mary’s Pizza in Sebastopol when DeSadeleer drove by and pulled over. “I’ve been here ever since,” said Nunez, as he lit the kiln at the front of the Santa Rosa shop. Water pipes work by creating a filtration system to cool and filter smoke as it’s percolated. Before water pipes began gaining mainstream popularity around 2000, there were pioneer lampworkers like Oregon-based Bob Snodgrass, a fixture in parking lots outside Grateful Dead shows. Today, a legion of lampworkers make incredibly ornate water pipes, with some selling for tens of thousands of dollars or more. A $1 million piece called “The Throne” — a goddess atop a lattice of bones — made in a collaboration by several well-regarded glass-blowers is being sold at an upscale Denver branch of Illuzion Glass Galleries. The art of water pipes tends toward neon colors, especially those revealed in ultraviolet light. At Homeblown Glass, customers typically spend between $50 and $1,000 on a single piece, DeSadeleer said. Over the years, the kinds of customers who walk through the door have broadened to include tourists, elderly clients, people in suits and always the curious. He still must scrupulously distance his business and products from anything related to federal drug paraphernalia laws. There’s greater competition, too. He’s spotted knockoffs of his designs at trade shows from outfits he believes are sending designs to cheap manufacturing plants in China. But the glass-blowing business is all DeSadeleer knows, and he doesn’t plan to stop. “Do what you do. Do it the best you can. What will be will be,” DeSadeleer said.